Zhuo Hui Electromechanical Co.Ltd - PROJECT - FOSHAN LEADEX FURNITURE CO.,LTD. Moves to new office, and requires high quality furniture to build a new environment. Customized cabinets not only make the entrance look tidy and neat, but also provide sufficient storage space. The reception desk uses a stylish, minimalist square box. Warm walnut and cool marble complement each other, concise and not cold. Walnut grain extends to leisure area and staff area. Zhuo Hui is young and energetic. 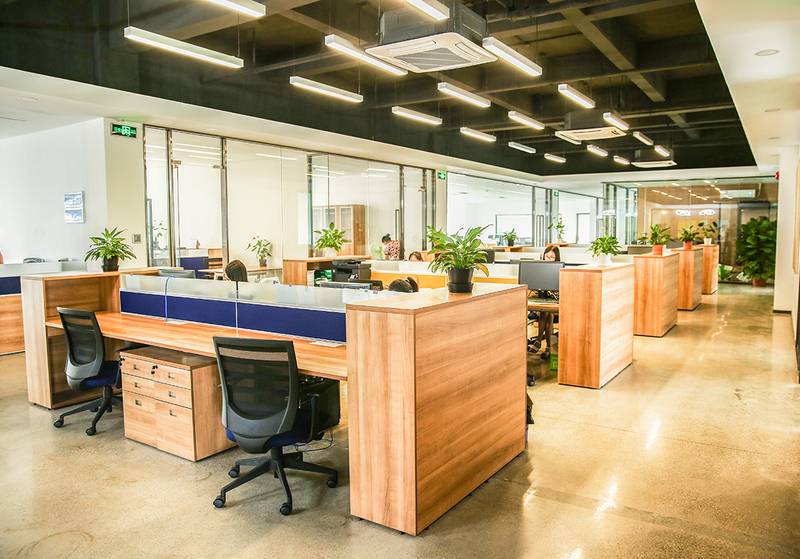 The overall design of the office tends to be youthful and lively. The general manager room uses dark grain. while the table top uses slim edge with streamlined shape. It is calm but young. Less is more, no superfluous furnishings, privacy space to think. Added on frost glass provides good balance between communication and privacy. File cabinet at the two ends of bench increases a lot of storage space and privacy level. A set of combined cabinets are embedded between two columns, which not only increases the storage space, but also makes the whole wall Lively. Open office encourages interaction and makes entire office atmosphere full of vitality. The design studio not only provides a spacious workbench for each designer, but also leaves plenty of room for quick change. can meet different types of communication mode. Small meeting room, provides concentrating space for 2~3 persons. Medium conference room for easy communication between a few people without interference. Large conference room, providing a wide range of formal communication venues. The leisure area is a green island built in an orderly office working atmosphere. A cup of coffee, a moment's stop, adds a lot of intersection between employees, the host and the guest. Thoughts collide here, inspiration takes place here, and company team culture takes root here. Clean and orderly, support independent work, undisturbed, this is the basic demands of financial personnel. To this end, each location is not only equipped with an exclusive file cabinet, but also placed high cabinets on the side of the wall at the entrance. Hanging desk screen is fixed in front of each seat, giving each employee a separate area.